It was a great moment for me and enjoyed the repreive from the stress and strain of the day. 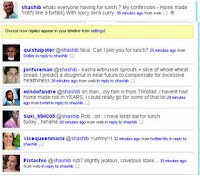 See how people shared their lunch or thoughts . Thank you all for sharing your time with me.